A year ago I ran in the Chicago Marathon. I got hurt in early August and didn't run for something close to 17 days. I tried running and it hurt. I went to the doctor, I got PT, I bought a 110 gallon horse trough to sit in and ice every day for 2 months. 3 weeks before the race, I did a 23 mile long run just to make sure I could stand to be on my feet for that long-- just to make sure I would run in the race. I did everything I could possibly do to get to the starting line and then again to the finish line in under 150 minutes. But 22 miles in, my legs cramped up and I had to stop. For 60 seconds I was stationary, thinking I wouldn't finish. But I started running again. 1 mile later, the same thing again. I stood on the side of the road for a minute, debating what to do. But I wasn't going to drop out... I just slowed down and tried to make it to the line. I ran 2:33:40. I was devastated. 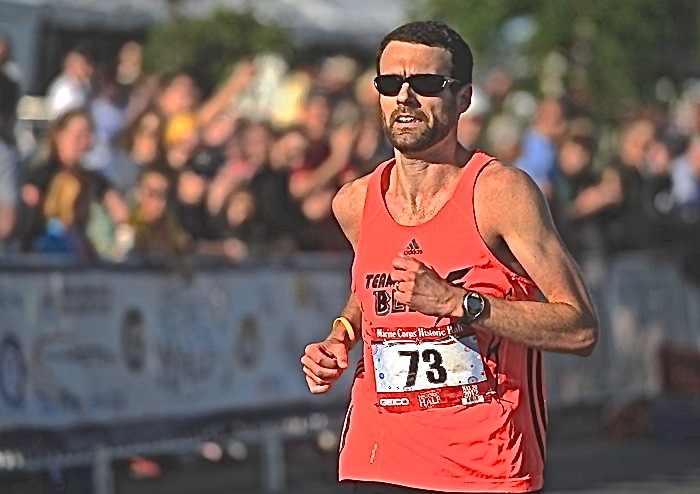 It took me a long time to recover from that, especially after I ran in the OBX Marathon 3 weeks later in 2:42:09. That was just a bad idea, but I thought I'd earn some money and I didn't. This year was much better. After the race, even immediately, I stayed up-beat. My body wasn't very interested in being happy, but I tried to keep a good attitude. I didn't train for this. I signed up for the race and had every intention of doing the work. And maybe leading up to it I wasn't as aware of what I wasn't doing as I should have been. But hindsight is 20/20. Since returning from Europe, I've averaged 7:07 pace for 612 miles. That's not enough and it's not fast enough. But I do morning runs at 7:40 pace! I do long runs at 7:00 pace. I'm actually shocked to have such a fast average! I guess that does include a half-marathon and a marathon at sub-6 pace, as well as 2 5Ks. But that's not much mileage run fast at all. So immediately after the race, I was toast. I slowly walked through the chute-- probably at least a half a mile! It felt like I was walking on pillows, the blisters were so bad. I assumed I was bleeding. I don't remember if I mentioned this in the race post, but I could feel the blisters for at least the last half of the race. Jon finished 5 minutes ahead of me in 2:29:13, four seconds off his PR. Chris didn't drop out and ran a 3 minute PR at 2:35:13. He sure closed the gap behind me over the last 10k. If only I could have held on to Jon... so the two of them were pretty pumped and talking to people in line. Since most of the people who'd finished ahead of us were in the elite section, the chute was pretty empty. I thought that I was going to pass out so I took as much food and water as I could get. I ate a whole pear fruit cup in one mouthful, I had a cup of chicken broth, a bottle of water... anything. They gave us our medal and we picked up our finishers shirt, which was a nice Brooks long-sleeve dry fit in royal blue. I'd carried Tim's shirt ticket with me in my pocket, so I told the second shirt table that my friend was in the medical tent and asked me to get his shirt. So what if that was dishonest? He paid his $100. He should get a shirt to go with his socks. 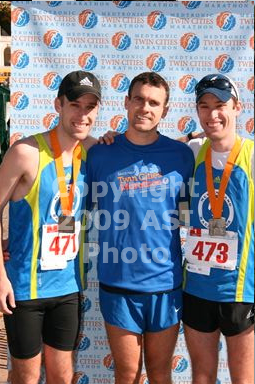 I grouped back up with the Healeys and we got some finishers photos together. Then we wandered off to find our bags. Mine was supposedly going to be in the Elite tent, which I didn't know how to get to. I walked by the regular bags and thought about asking them for mine, but instead I hobbled on down the road. The elite tent was fenced off to us plebeians, but I talked some guys into lifting it up so that I could get through and get into the elite tent. I kept my finishers shirt on so that my loser number wasn't visible. The elite tent was a nice place. It was warm, there was food (the same food as outside), they had finishers shirts and medals, and people giving massages to everyone. The bags were all lined up on the floor, but guess what, mine wasn't there! The bag guy asked me what number mine was... but it wasn't there. He felt bad and called his boss, who then went to go look in the regular bag check, but it wasn't there either. I sat down in a chair and let the overwhelming feeling of Karma sink in along with the pain in my legs and the bottoms of my feet. The bag guy kept coming by to let me know that they were working on it, but I was losing hope. I gave up and told the guy I was leaving to see if my friend had it. But Charlie did! As I wandered out of the tent, Charlie came running up (jackass) screaming my name! He'd grabbed my bag as they escorted him into the elite tent after finishing. He didn't think I'd be able to get into the tent to get it, so he was just looking out for me. All ended well. But somehow, despite running a PR 2:26:42, he was able to jog over to the tent to find me. He walked back with me to the family meeting point where Jon, Chris and Alison were waiting under the H sign. We sat under the sign for a while recovering before catching a ride on a school bus back to the Metrodome. Everyone cleaned up, the Healeys left for the airport, and Charlie, Alison and I headed out to dinner. We went to this place that Alison found on the internet, Psycho Suzi's Motor Lounge. She wanted us all to get real drunk so she picked a place that served drinks based on their alcohol content. The menu wasn't anything spectacular. It was happy hour and I should have gotten the $3 rail drinks during happy hour, but instead we got the specialty drinks that had to be sorted by tiki gods. There weren't any drinks that were with the feeble tiki god. I got something that was like a tropical white russian. It was ok... Food wise, Alison and I split a Chicago-style pepperoni pizza. So two marathons in a row, we were having Chicago pizza. 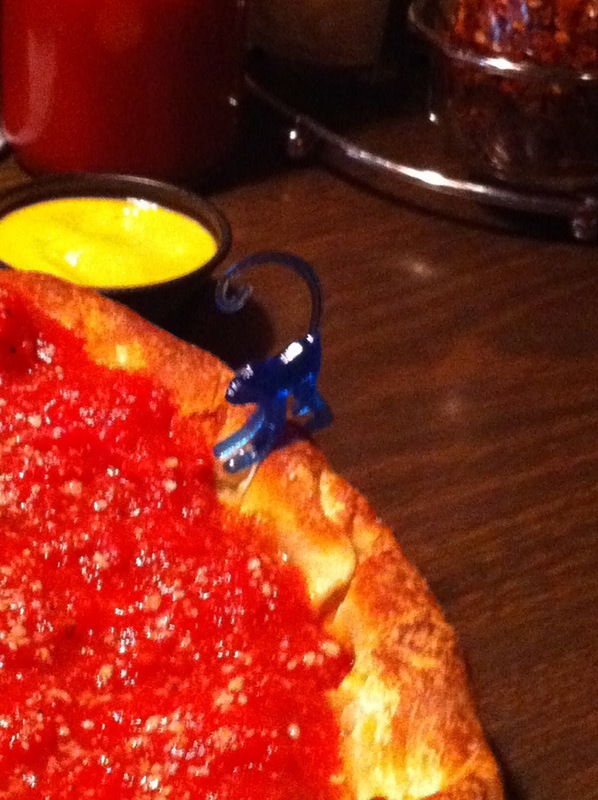 My drink came with a little blue monkey in it, and he wanted to eat the pizza too. The highlight of the bar was that the Redskins-Eagles game was on TV. Other than that it was a pretty useless place. I could barely see what was happening on the TV, but the score was visible. Alison realized that her eyes were bigger than her stomach and that she didn't want to get really drunk anymore, so we rode a cab back to the hotel just in time to catch the end of the the Redskins' victory! Charlie's friend, Chuck Love, stopped by the hotel and we walked to Target to waste time and then shot the breeze outside of the hotel for a while before Charlie and I decided to call it a night. I fell asleep in the hotel room watching Shooter on TBS. Pretty uneventful. The next morning I woke up and packed up and went a few blocks down to Panera to get breakfast. I looked like a homeless person carrying a gallon jug of water and not dressed for the weather. I packed poorly and didn't bring enough clothing to wear that would be clean and warm at the same time... but homeless chic fits me well. Breakfast was delicious and we headed to the airport. The flights were uneventful. I listened to a podcast will Bill Aris from Fayetteville-Manilus about the process being the goal and it made a lot of sense to me. I need to get back to the process, making sure that every run is worth something and has a purpose. I also wrote my post through about 20 miles before my battery died and I returned home. I need to train harder if I want to run faster.